We are excited to announce the launch of Royal Maintenance Coprs Website rmc.mil.jo , The diverse workforce of engineers, technicians and other professionals in the army. 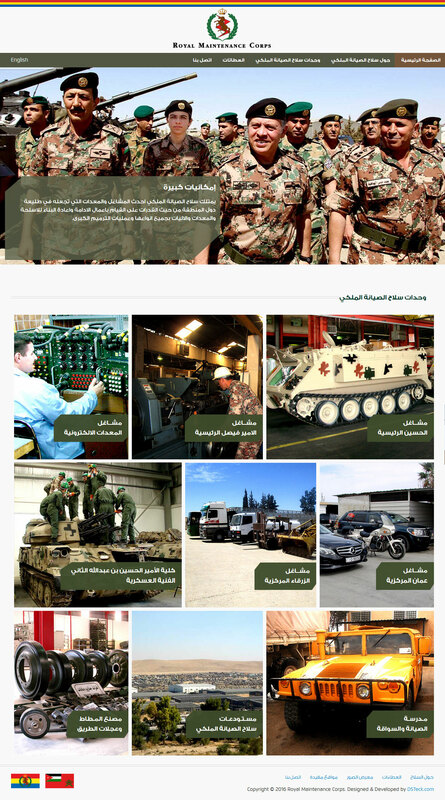 The Royal Maintenance Corps (RMC) aims to achieve all the maintenance matters, as well as to provide direct and indirect technical support up to the depot level to all Jordan Armed Forces (JAF) vehicles, equipment, weapons and their assemblies and sub-assemblies in all applied engineering fields. RMC vision is to become the best house of experience for industrial and technical excellence in the vehicles technology and weapon systems in Jordan by being uniquely vital, technologically superior cost effective, and unconditionally responsive to all JAF units.